When most business owners, managers and HR professionals hear the word “audit,” images of Canada Revenue Agency (CRA) inspectors combing their financial records immediately come to mind. While a visit from the taxman can be a source of anxiety for any executive, another area of exposure poses just as much risk for their businesses, and that comes on the human resources front. Time and time again, we’re called upon to help organizations — ranging from SMEs to major corporations — address and repair damage from an otherwise preventable HR law-related incident. By then, however, it’s often too late to do more than simply react and manage the issue. It’s at that point that matters can become costly. Business leaders are often left with little choice but to remedy the situation by paying hefty fines or reaching sizeable out-of-court settlements, unless they opt to take the even more expensive litigation route, where a favourable judgment is never guaranteed. The solution, of course, is to take a proactive approach in designing a comprehensive and effective employment law compliance and HR policy foundation. It starts by understanding your jurisdiction’s relevant employment legislation as it relates to your business, then ensuring you comply with the law. That’s especially important in Canada, where workplace legislation is changing in provinces on an increasingly frequent basis, leaving employers exposed to potentially crippling legal and financial risks. As the speed of legislative change intensifies, many employers are left confused by their obligations. 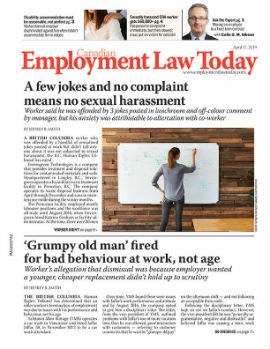 Even HR professionals are finding it difficult to keep pace, opening the door to a wide range of consequences including potential administrative penalties, fines, unfavourable tribunal rulings or employee lawsuits. Worst of all, a visit from a labour inspector that turns up legal violations in your workplace could serve as a red flag to other agencies — think CRA, for example — that can open the door to unwelcomed scrutiny.